If you’re part of the autism community and you’re on Facebook there’s a good chance you’ve heard of Ink 4 Autism, the place where an autism tattoo is everything. If not, seriously, where have you been? 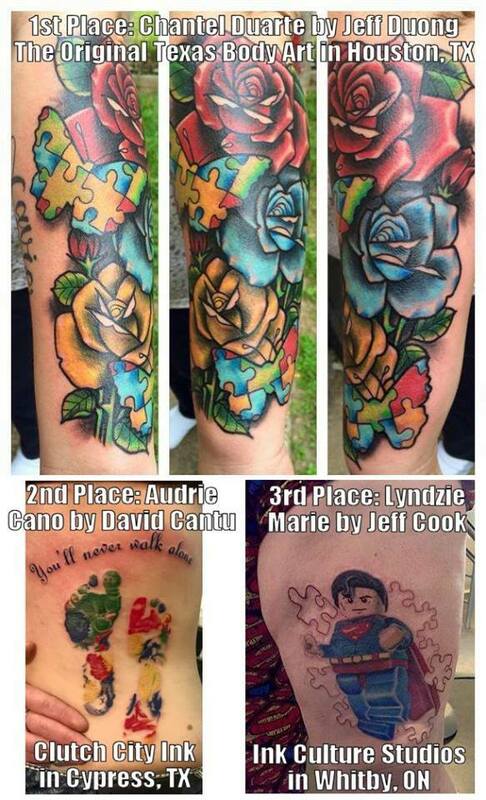 Ink 4 Autism combines autism tattoos with raising money for local autism charities. Here the founder, Jack Skorochod, talks about what inspired him to set up this cause, and how every April you can raise money and awareness by having an autism tattoo. 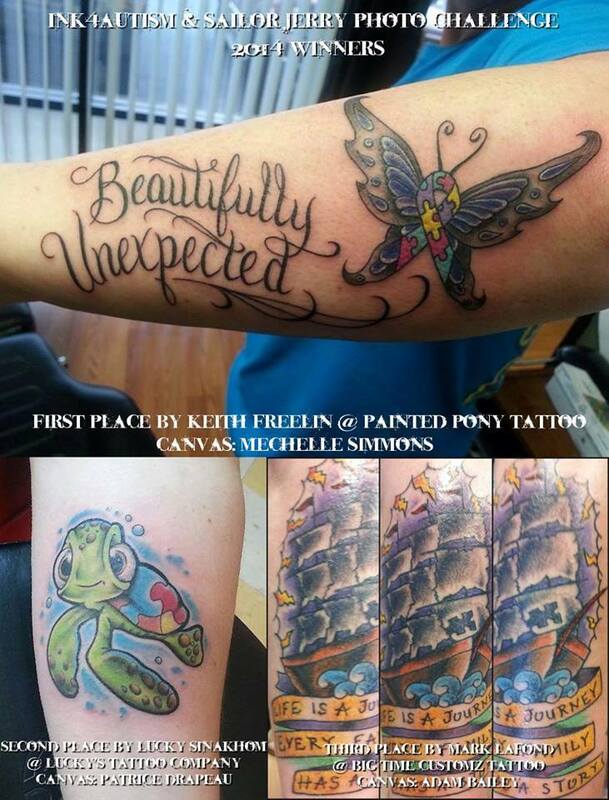 I have tattoos dedicated to my wife, sons, family, as well as some memorial tattoos. When my son Lincoln was diagnosed with autism at 5 years old, I got a tattoo to show support for his autism. The idea for Ink4Autism happened in November 2011 when I visited my tattoo artist friends at The Lost Anchor Tattoo Parlor while they were running their “Movember” fundraising campaign (“Movember” is an annual fundraising event where people grow out mustaches to raise awareness for cancer.) The crew at Lost Anchor were doing mustache tattoos with the proceeds being donated to the campaign. I thought it was a great idea and figured, why not do this for autism? My first year I got 18 tattoo shops in the US and Canada to take part. People would find out about it through our Facebook page and they would tell their artist friends about it. By the second year I had about 75 shops and had added Australia and the United Kingdom to the list, and it has continued to grow each year. Autism tattoos act as a permanent showing of love for those with autism in our lives. Tattoos are no longer stereotyped as being for criminals and we are raising awareness for autism at the same time. I will proudly display my autism tattoo until the day I die. I love hearing the stories of people that NEVER would think of getting a tattoo, and they are getting an autism tattoo to support their loved ones with autism, and to me the most touching tattoos are the sibling pieces. As a dad, watching that kind of support from a sibling is incredible, something I get to witness every day with my own kids. A very popular symbol for autism is the puzzle piece, and is used in many of the tattoos that people have. For some people though the puzzle piece is offending and upsetting. I love the puzzle piece and I don’t agree that it implies that something is missing from my child. My daughter was the missing piece to my life’s giant puzzle and now I have my lost piece. I see the puzzle piece as the mystery of autism. It’s just one of the parts that make up my son. I know others don’t see it that way and it’s alright to have someone see something differently than I do… and neither of us is wrong, because we are all on the same path. Ink4Autism is a one of a kind fundraising initiative. Since 2012, it has been helping spread autism awareness on a permanent level with autism themed tattoos. During the month of April, you can go into a participating shop to get an autism themed tattoo and the funds are donated to numerous autism charities. Tattoo shops in 11 different countries around the world have participated in this campaign and since 2012 Ink4Autism has raised over $80,000 for autism services. Reasons to be cheerful, 1, 2, 3!